Recently I rediscovered my love for sweet potatoes. 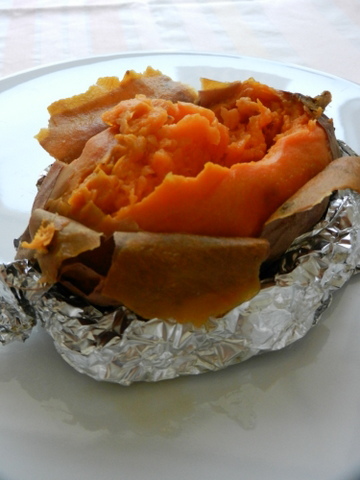 When researching for ingredients that bring a wealth of important anti-oxidative and anti-inflammatory properties I found the sweet potato has it all! Extremely high in Vitamin A, also an excellent source for Vitamin C, D, B6 and B5, manganese, iron, triptophan, potassium, dietary fiber this root vegetable can truly help preventing oxidative damage to our cells, to balance energy levels and moods, to support skin, heart, nerves, bones and teeth. Despite its sweet taste the natural sugars are released s l o w l y into the blood stream. Wow. 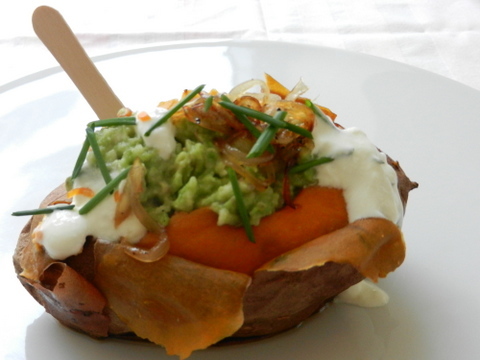 Look for smaller sweet potatoes, so you can use one whole sweet potato per portion. Brush their skin to clean them. Wrap them in Aluminium foil and bake them at 220 degrees Celsius for around 30-45 minutes, depending on their size and thickness. Test if they are done: Press your fingers against the aluminium foil. You can feel it if they are soft inside. 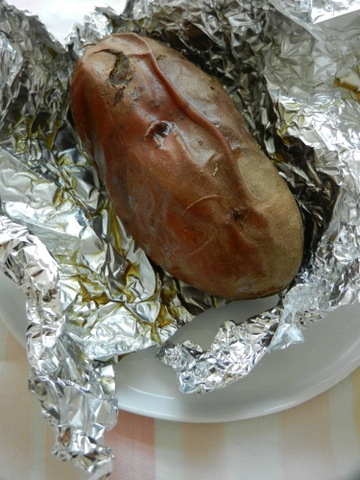 Then unwrap the sweet potato and open the skin. 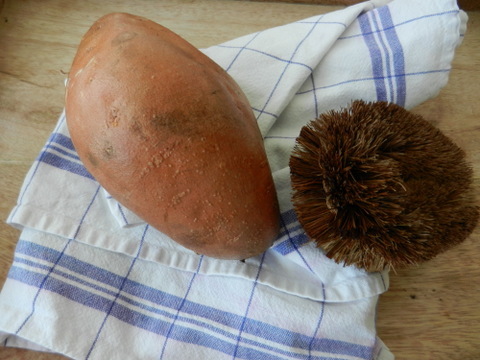 Mash the sweet potato flesh and season it with a little bit of salt and pepper. Finally spoon on a generous portion of freshly made guacamole (avocado, lemon juice, salt. I love adding some chilli for a hint of heat to balance the sweetness, in this case I din’t use cilantro nor tomatoes) and sour cream. Top with chives and caramelized onions. 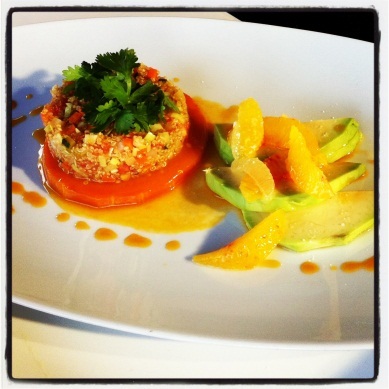 Eat well and look gorgeous!